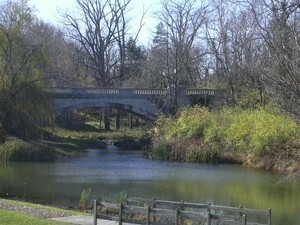 Indianapolis parks - theres's one near you! If you´re looking for a fun and inexpensive way to spend a sunny day in Indianapolis, simply pack a picnic lunch and head to the park. Chances are you won´t have to go far to find one, since tucked into and around Indianapolis real estate are two state parks, six regional parks, and a slew of community and neighborhood parks. Whether it´s a brisk, scenic hike you want, or just a place to throw a Frisbee, there´s an Indy park out there for you! Located along the banks of the White River, Broad Ripple Park was once the home of a carousel now found in the Indianapolis Children´s Museum. Picnic areas, a fitness trail, tennis courts and a variety of special programs and activities are available. If it´s Fido you´re trying to entertain, be sure to visit the Bark Park. At nearly 4,000 acres, Eagle Creek ranks as one of the largest municipal parks in the United States. Lilly Lake, inside the park´s boundaries, offers fishing, swimming and boating opportunities. Cross country ski paths provide recreation during the winter months, and wildlife enthusiasts will appreciate the marsh and bird sanctuary. Once an active duty Army post, Fort Harrison is now a state park open to the public. Horseback riding, hiking trails, sledding hills, picnic and recreation sites are just some of the attractions that make Fort Harrison one of the best-kept secrets in the Indy area. While you´re there, be sure to take in a history lesson at the former World War II prisoner of war camp. See the complete list of Indianapolis parks.